Spring Stashbust is just around the corner and i am a little stressed at how few sign-ups we have. 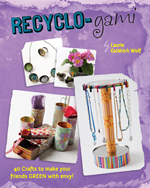 A copy of a fun, fashionable, eco-friendly book that will give you 40 ways to upcyle. Its my only copy and it is going to be one lucky stashbusters score for just signing up! Yes you heard me sign up for the stashbust by the 19th of March and I will enter you into a drawing for this book.